Carolina Preserve™ is a Del Webb® active adult community in Cary, NC. Located in the heart of the Triangle area between Raleigh, Durham and Chapel Hill residents enjoy access to great culture and top-notch medical and educational institutions. World-class amenities, an active lifestyle and quality ranch homes have made Carolina Preserve a hit with active adults. Carolina Preserve™ is located in the prestigious Amberly master planned community in Cary. Residents of the age-restricted Del Webb® neighborhood enjoy exclusive access to a private clubhouse in addition to the shared use of an amenity center in the Amberly subdivision. The surrounding area is renowned for its proximity to great healthcare, continuing education, culture and entertainment venues, and great shopping and dining establishments. Cary continually ranks as a “Best 5 Small Cities to Live” by Money Magazine. 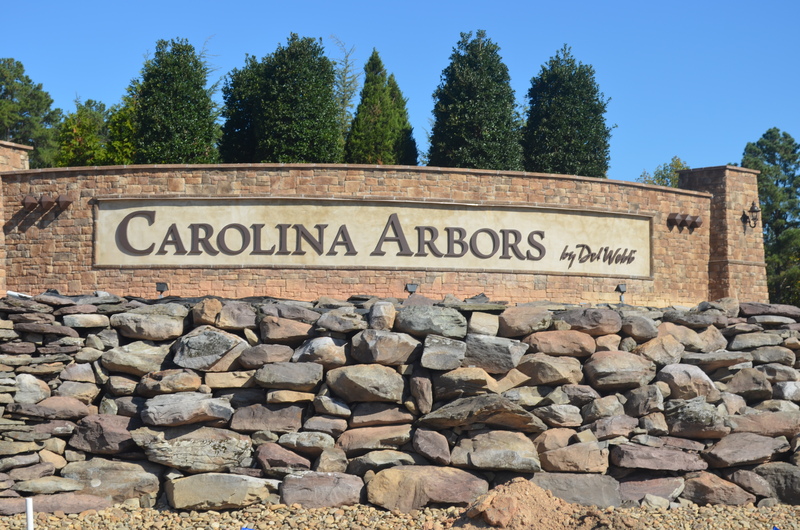 The new Carolina Arbors™ by Del Webb® is the most popular Active Adult Community on the East Coast. Carolina Arbors has over 200 residents in just one year of the residents moving into the community. Carolina Arbors™ unveiled new floor plans and Model Homes based on focus groups of Active Adults on the features they are looking for in a new home. Anticipated collections include Passport, Expedition, and Pinnacle Collections. Low maintenance living—yard maintenance included in homeowner’s dues. Clubhouse will feature an onsite lifestyle-director, an indoor pool, fitness center, ballrooms, billiard rooms, tennis courts, bocce courts, putting greens, walking trails and MORE! The new fitness center is scheduled to open in the summer of 2015. 1.5 miles to Brier Creek, which offers shopping, dining and golfing. Close to Duke, UNC, and Wake Med Hospitals. Heart of the Triangle! Convenient to RDU International Airport, boating, biking, hiking, fishing, continuing education, cultural events, plays shows, collegiate sports and NHL. Dedicated dog park for the residents with dogs. Based on the similar sized Carolina Preserve™ metrics at 380 Acres, the north Brier Creek community could easily have more than 1,200 homes at buildout. **“Del Webb® and Duraleigh Arbors™ are trademarks of PulteGroup, Inc. of Bloomfield Hills, Michigan and are used herein to convey purely factual information relating to the listed residential developments. No association, sponsorship, or affiliation between this website, its owner(s), or parties posting content on this website exists with PulteGroup, Inc.
Fearrington Village in Pittsboro, North Carolina is an age-targeted community with 15 quaint neighborhoods situated on a historic farm site near Chapel Hill. Rolling hills and pastures surround this beautiful community where visitors and residents alike are greeted by scenic views in a charming setting. However, life here is anything but antiquated. Stores, restaurants, banks, and a spa are only some of the on-site conveniences. Heritage Pines in Cary, NC is a 298-home active adult community with single family homes and one-story villas. The community includes tree-lined streets, a socially active lifestyle and an amenity filled clubhouse. It retains a small-town atmosphere where making new friends is easy and neighbors are friendly. Heritage Pines in Cary was built by K. Hovnanian Homes (KHOV) and Westminister Homes between 2000 and 2006. The community is ideally set in the heart of the Triangle area between Raleigh, Durham and Chapel Hill. This home is complete. All homes in this community are resales. Regency at Brier Creek Country Club in Raleigh enjoys a prime location in the middle of North Carolina’s popular Triangle area. While Brier Creek is open to all ages, the Regency neighborhood in the community is age-targeted towards mature buyers and includes low-maintenance homes designed to appeal to active adults. These elegant ranch homes, built by Toll Brothers, include desirable features such as spacious master bedroom suites and over-sized two-car garages. Set within 15 minutes of downtown Raleigh, Durham and Chapel Hills, Regency at Brier Creek offers close proximity to many shopping, dining and cultural attractions. Within the community, residents will enjoy such amenities as the 18-hole championship golf course, the Swim and Tennis Pavilion, and the 40,000 square foot clubhouse. Surrounded by culture and nature, Renaissance at Regency is an inviting community on 165 acres with charming English-styled homes along Symphony Lake in Cary, North Carolina. Here, active adults will find quality and luxury construction at affordable prices. In addition, all cottages are truly maintenance free with professional landscaping and irrigation. New buyers have the opportunity to build their new dream home and establish a foothold in this desirable, established area in Cary. With only 114 home sites, this quaint neighborhood will retain a close community feel. Renaissance at Regency Cottages welcomes buyers of all ages. However, active adults and retirees will find the lifestyle appealing to their needs and wants. Known as the “Peak City,” Apex is one of the fastest growing communities in Wake County. With a small town feel and big town amenities, Apex is one of the Triangle’s most popular destinations for retirees. It is noted for its scenery and the quaint historic downtown district. The Orchard Villas enjoys easy access to Raleigh-Durham International Airport and Raleigh, Durham, and Cary are a short drive away. Nearby amenities include Jordan Lake, a community library, shopping, restaurants, health care providers and other services. Chapelwood is an age-restricted neighborhood with an appealing streetscape and is located in the master-planned community of Downing Creek in Chapel Hill, North Carolina. Hagood Homes develops these residences with green building techniques and utilizes the EPA’s Energy Star for New Homes Programs. While resale inventory is available, new buyers have an abundance of customization options at their disposal. Surrounded by the wooded and pastoral property of the UNC Alumni-Faculty-Staff Recreation Association (also known as The Farm), Chapelwood has a natural ambiance. The community further enhances this atmosphere by keeping 30 percent of its land undeveloped. With only 69 single-family homes scheduled for completion, this serene community will also keep its intimate appeal.